Peppermint tea is a popular beverage around the world. 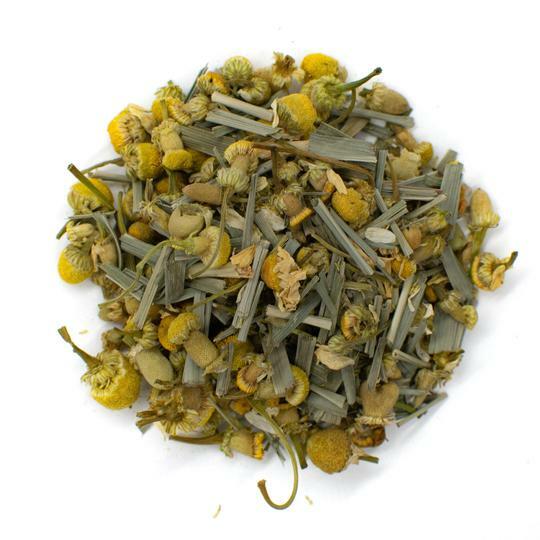 Its health benefits rival those of green tea and its flavor is refreshing and crisp. The peppermint plant is a hybrid between watermint and spearmint. It's often found in the wild and is extremely hardy so it can be grown in many home gardens. 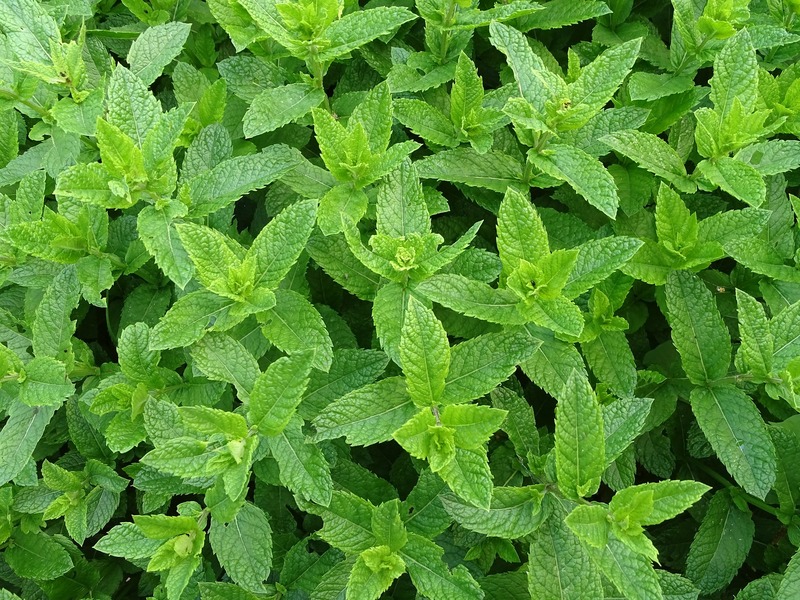 Peppermint contains high levels of menthol that give it its characteristic cool, refreshing flavor. It's often used in toothpastes, candies, and ice cream thanks to its pleasantly intoxicating nature. Mint also blends well with various flavors, making it a great tea base that can be spiced up by adding new ingredients. 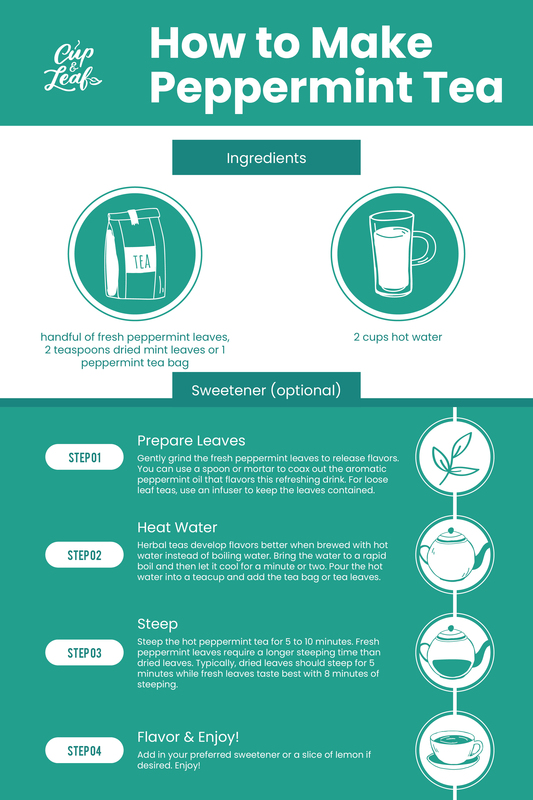 Find out more about this popular tea and how to brew different varieties at home. Peppermint tea is renowned for its ability to aid the digestive system. 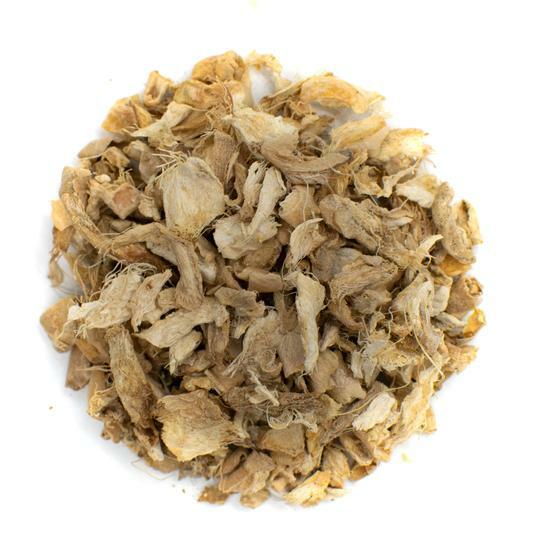 It's widely used to alleviate stomach problems such as nausea, gas, and cramps. Peppermint tea has antispasmodic effects that help to relax stomach muscles that can overreact and cause cramping and bloating. 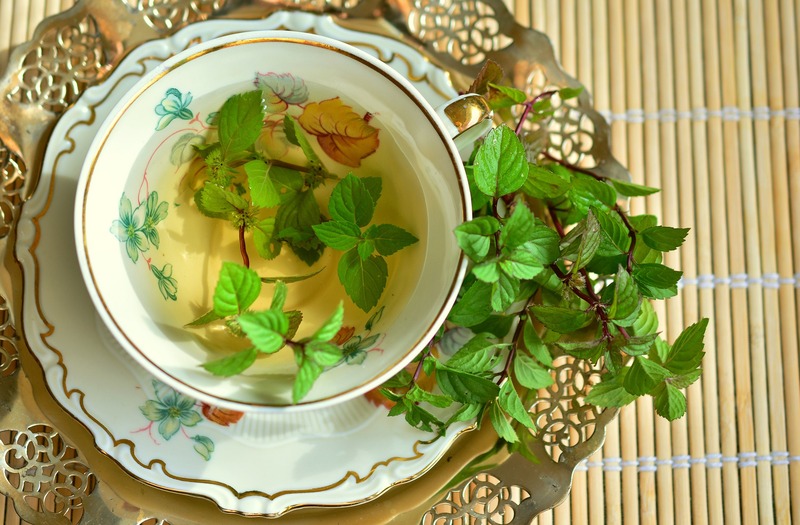 Studies have shown that peppermint tea has anti-parasitic properties that can fight off infections such as giardia that create digestive problems. Peppermint tea also contains antioxidants that increase bile production. This helps the digestive organs to more readily break down and process food. Peppermint tea is best consumed during or after a meal to reap these health benefits. Peppermint tea can also help to improve mood and improve memory. It increases alertness and jump-starts your day without the negative side effects of caffeine. Research has shown that peppermint increases accuracy of memory recall (1). The brain protecting powers of peppermint tea may inhibit the development of neurological diseases such as Alzheimer's and Parkinson's disease. Its no wonder peppermint tea is a staple in many households. Use these mint tea recipes to make a standard cup of fresh mint tea or spice things up with new flavor infusions. It's easy to make peppermint tea. 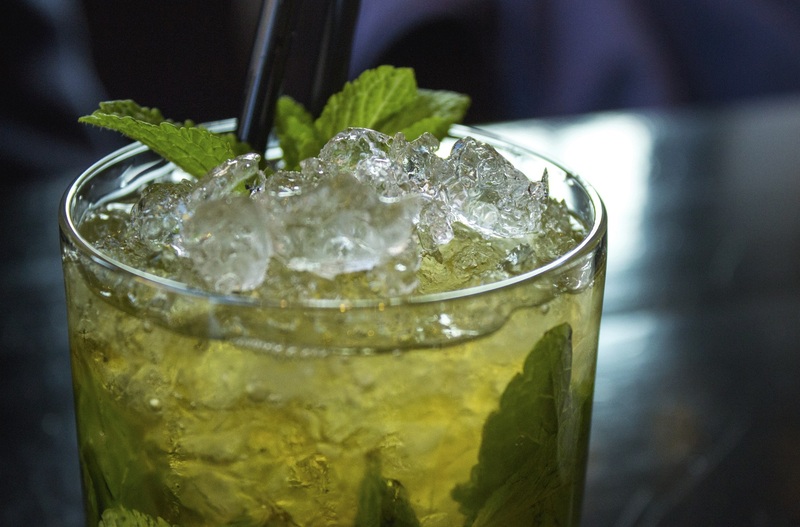 The mint plant blends well with many different flavors so you can play up the sweetness or freshness of this beverage. The different varieties of mint also lend unique tastes to this brewed tea. You can brew authentic Moroccan mint tea or choose one of the other options below. 1. Prepare according to the instructions on the bag if you are using tea bags. Fresh leaves require a bit more preparation, but it isn't time consuming. Gently grind the fresh peppermint leaves to release flavors. You can use a spoon or mortar to coax out the aromatic peppermint oil that flavors this refreshing drink. For loose leaf teas, use an infuser to keep the leaves contained. 2. Herbal teas develop flavors better when brewed with hot water instead of boiling water. Bring the water to a rapid boil and then let it cool for a minute or two. Pour the hot water into a tea cup and add the tea bag or tea leaves. 3. Steep the hot peppermint tea for 5 to 10 minutes. Fresh peppermint leaves require a longer steeping time than dried leaves. 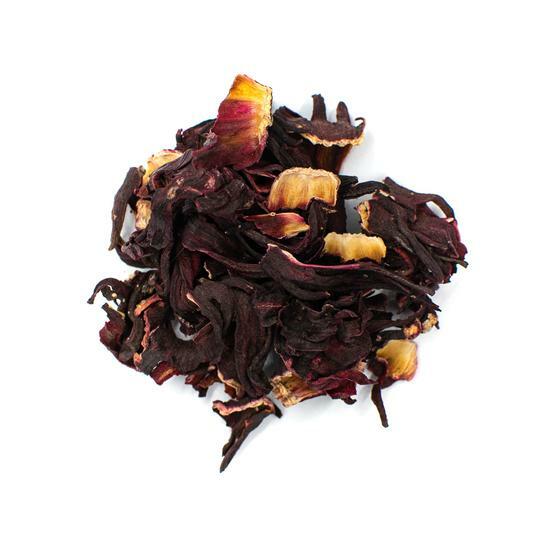 Typically, dried leaves should steep for 5 minutes while fresh leaves taste best with 8 minutes of steeping. Use a lid to cover the tea cup when steeping to lock in the flavor and moisture. The longer the leaves steep, the stronger the flavor. Taste after the first 5 minutes and then in 30 second intervals to find the best flavor for your palette. Add in your preferred sweetener or a slice of lemon if desired. 1. Harvest fresh peppermint leaves, rinse, and pat dry. Gently crush the fresh peppermint leaves to enhance flavor. 2. Use a tea kettle or stovetop pot to bring water to a rapid boil. Cool for 1 to 2 minutes before adding the mint leaves. Steep the leaves for 5 to 10 minutes. 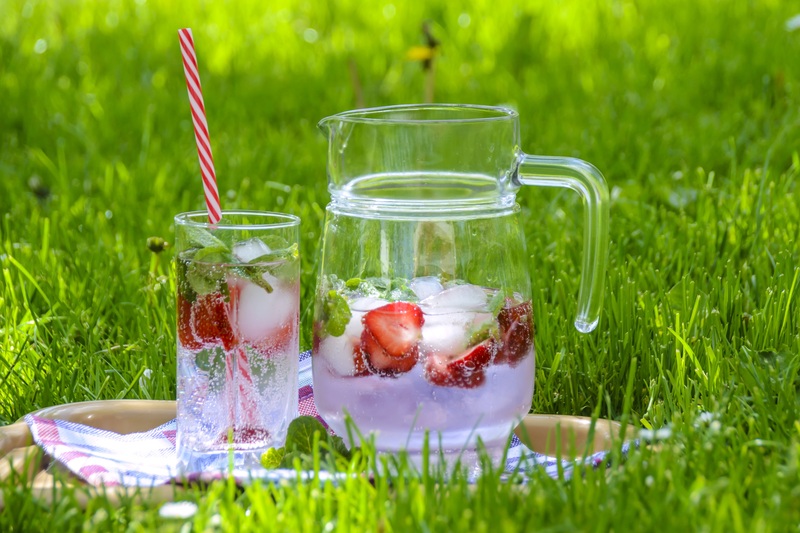 3.Use a tea strainer to remove dried or fresh leaves and pour the water into a large glass jug. If you are using tea bags, simply remove them from the water and discard. 4.Sweeteners dissolve better in hot or warm water than they do in cold water. Add sugar cane, brown sugar or honey to the water while it is still warm. You can also use simple sugar or alternative sugar syrups. Squeeze the juice of two fresh limes into the tea. 5. Let the tea cool to room temperature. Once cool, place the pitcher in the refrigerator for 3 to 4 hours. 6. Add 3 to 4 ice cubes to tall glasses. Pour the tea liquid into the glasses and serve immediately. Garnish the peppermint iced tea with a lime. 1. Fill a large pot with water and add in the ginger and 3 lemon slices. The other lemon slice will be used for garnish. Bring the water to a rapid boil and turn the heat down to medium. Add in the peppermint leaves and allow the tea to simmer for 8 to 10 minutes. 2. Add the sweetener to the hot water if desired. Honey and agave are great options if you're making organic peppermint tea. 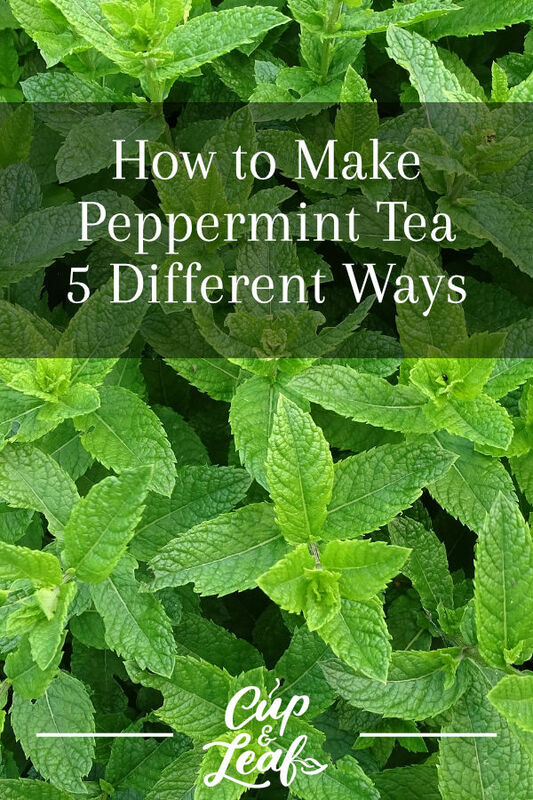 You can also steep one stevia leaf with the peppermint leaves for a subtly sweet and all natural flavor. 3. Remove the leaves and ginger pieces using a fine mesh strainer. 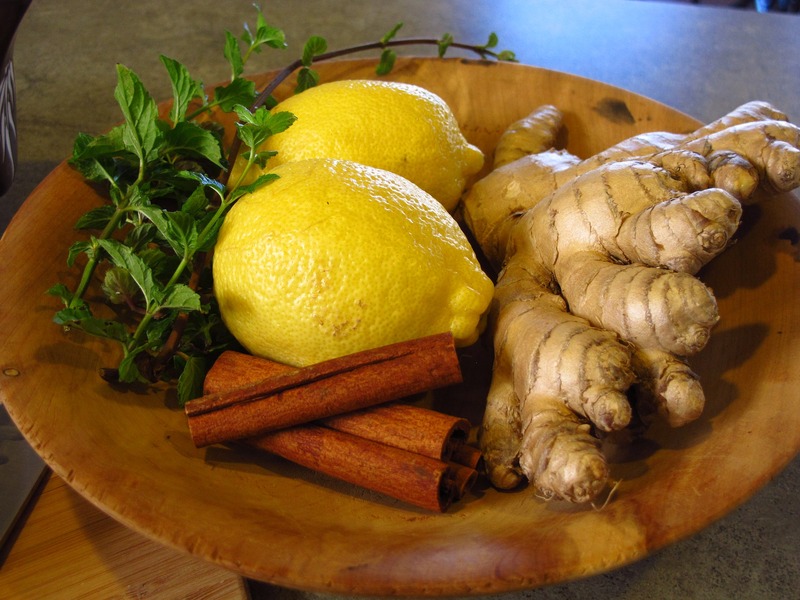 Garnish with a slice of lemon, cinnamon stick, and a mint sprig. This recipe was dreamt up by Kathie at Homespun Seasonal Living. 1. Mix everything together well. 2. Store in airtight jar. 3. To use: Steep 1 Tablespoon in 8 ounces of boiling water. 4. Garnish as desired. Make your chocolate mint tea indulgent by adding a dollop of whipped cream. Add a holiday spin to the drink with crushed candy canes or ground gingerbread. Cinnamon and nutmeg also add a nice touch to finished chocolate mint lattes. Peppermint tea infused with fruit is a great tea for summertime. The sweet flavors of fruit contrast with the crisp taste of peppermint. You can use any fruit you like. Mint blends are particularly delicious with berries, figs, and citrus fruits. You can also opt for tree fruits including cherries, apricots, and plums. Stone fruits such as apples and pears heighten the crisp note of peppermint. Alternatively, you can infuse peppermint tea with flowers and herbs for an earthy flavor. Follow the recipe below using your desired fruits or herbs. 1. Bring water to a boil and add in the fresh mint leaves. If you are using herbs or flowers, add those in now. Allow the mixture to simmer and steep for 10 minutes. 2. Strain the tea leaves and let the pot cool completely. Add in any sweeteners while the water is still hot. 3. Add in fruit if desired and chill in the refrigerator for 3 to 4 hours. 4. Add the ice to the pitcher for serving or simply fill glasses with a few ice cubes. Serve immediately. Peppermint is a rock star whether you enjoy a warm cup of tea or a refreshing, ice-cold beverage. 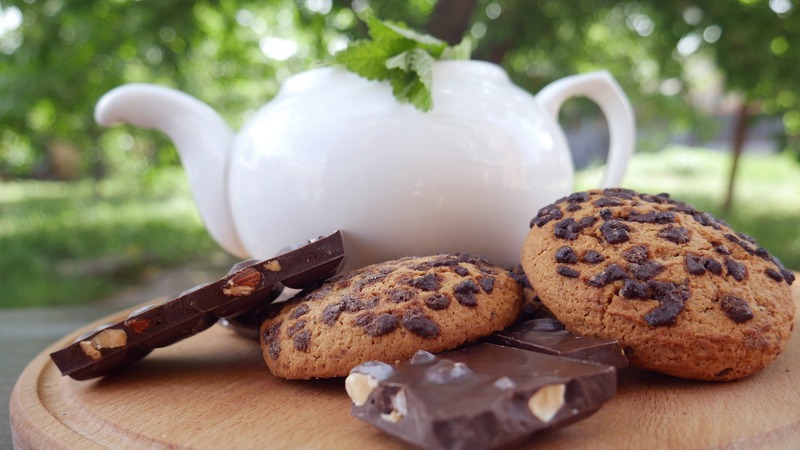 The fresh finish of the peppermint leaves pair well with flavors such as chocolate and lavender. The possibilities of mint tea blends are endless. Play with different combinations and create tea that you love to drink. 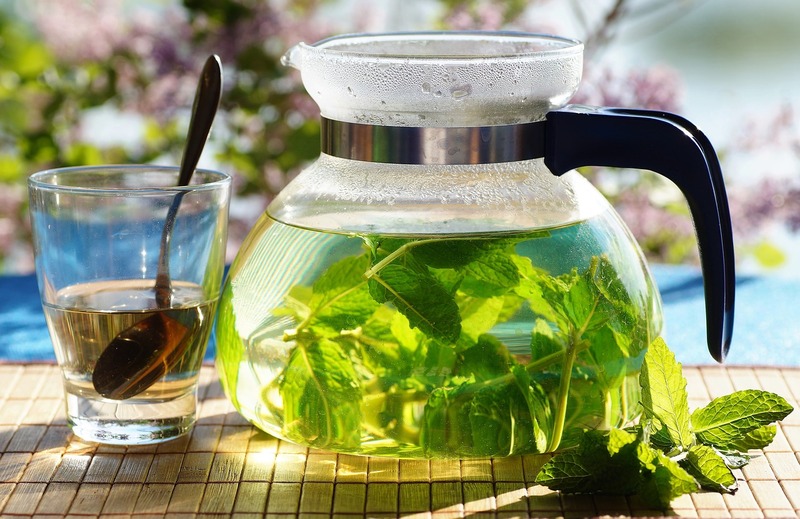 Grow your own herb garden right in the kitchen to make hand-harvested and fresh peppermint tea.